Do you want to plan a relaxing vacation while also keeping your getaway on budget? Pigeon Forge in the Smoky Mountains is an excellent place to plan an affordable vacation! With incredible free attractions like the Great Smoky Mountains National Park and lots of cheap lodging, it's easy to plan a budget-friendly trip to Pigeon Forge! Lodging is one of the most expensive items for any vacation, so we made this guide to help you find a Pigeon Forge cabin for under $100 a night! Book My Cabin Under $100! One of the best ways to save money on your trip is to visit Pigeon Forge during the low season. Most visitors come to the Smoky Mountains during summer and fall, so rates for cabins and other lodging are higher. On the other hand, if you'll find that reserving a cabin during the slower winter and spring seasons is often more affordable. Do note that booking a cabin on a major holiday can be more expensive. As an added perk, if you reserve a cabin during the low season, you'll also be able to enjoy Pigeon Forge and the Smokies without dealing with the crowds! Rates for cabins are often higher on weekends, so planning to visit Pigeon Forge during a weekday is another way to find a Pigeon Forge cabin under 100 dollars a night. If your schedule is flexible enough to plan a weekday vacation, you'll also run into fewer crowds during your stay! 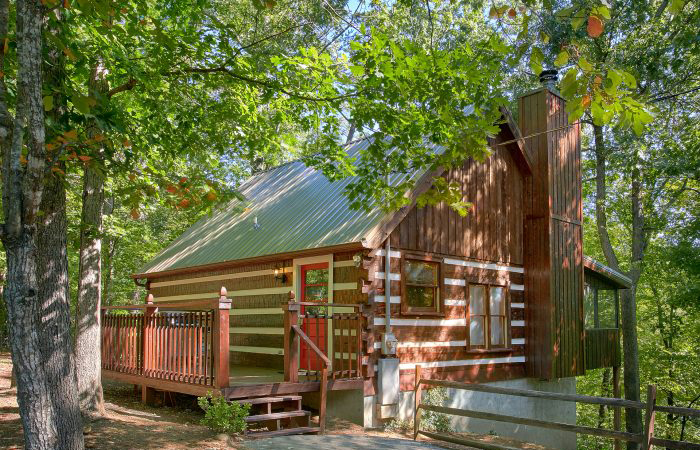 An easy way to find a cabin rental for under 100 a night is to reserve a smaller 1 or 2 bedroom cabin since these rentals are often available at lower rates. While many of these cabins are ideal for honeymoons or romantic getaways, they can also sleep as many as 8 or 10 vacationers. Since many of these 1-bedroom and 2-bedroom cabins come with sleeper sofas or futons, they can easily sleep enough guests for a family or a small group of friends! Cabins located outside of Pigeon Forge or Gatlinburg city limits are often rented at lower nightly rates. Sevierville or Wears Valley are good places to look for these affordable cabins since they are also only a short drive from attractions in Pigeon Forge and Gatlinburg. Better yet, many of these properties offer secluded locations that ensure you'll enjoy plenty of peace and quiet during your stay. To stay tuned for our latest deals and offers, be sure to sign up for our newsletter! 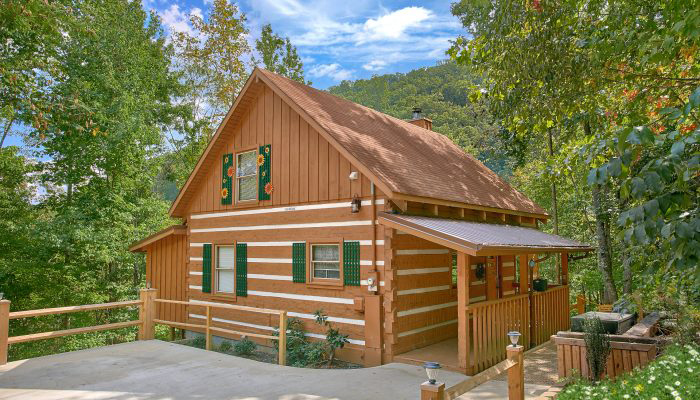 With one of our special offers, it's much easier to find a Pigeon Forge cabin for less than $100 a night! Even our budget-friendly cabins offer excellent amenities like hot tubs, game rooms, jacuzzis, and decks with Smoky Mountain views to enjoy during your vacation. Some rentals are pet-friendly, so you can even save money on boarding your beloved pet! Lastly, most of our cabins also provide WiFi Internet access and full kitchens. With a full kitchen, you can easily save money by eating cost-effective meals in the comfort of your own rental. We hope these tips for finding a Pigeon Forge cabin under 100 make it easier for you to have an affordable stay in the Smokies! Better yet, if you book your cabin online with Cabins USA, you'll earn a 15% discount on your nightly rate! Simply check a property's availability to see how much you can save on your stay in Pigeon Forge! Need help finding an affordable cabin? Feel free to call our helpful reservations office at (865) 429-4121. Here’s a quick look at our brand new cabins in Pigeon Forge. These cabins are new to our program in 2019 and offer plenty of luxurious features that will make your vacation to the Smokies absolutely unforgettable. Enjoy a unique attraction at Smoky Mountain Llama Treks, where you can pet and hike with llamas. This one-of-a-kind attraction's owner offers an uplifting and inspiring experience in a quiet part of the Smokies. Looking for romantic restaurants in Pigeon Forge, TN? Our guide helps you pick out the best spot to take someone special on a romantic dinner for two on you Smoky Mountain vacation! Please Note: Cabins USA LLC's, hereinafter referred to as Cabins USA, area information, area events, and blog pages are provided as a public service. Cabins USA does not endorse any of the products, vendors, consultants, or businesses referenced in these web pages. Any mention of vendors, products, businesses, or services on the Cabins USA web site is for informational purposes only. Users of this web site are responsible for checking the accuracy, completeness, currency and/or suitability of all information. The inclusion of this information does not imply endorsement by Cabins USA. Furthermore, specific questions regarding any content should be directed to the appropriate organization and not necessarily to Cabins USA. Interested in receiving our newsletter? Simply provide your full name and email address in these fields to begin receiving information. By doing so, you can learn about special promotions and events in the Smoky Mountains! We respect our customer's privacy and feel it is disrespectful to bombard anyone with emails. We treat all information that customers share with us as private and confidential. Cabins USA never shares this information with third party sites. Below are several boxes in which you can either select from a drop down list or click on a check box to the left of an item to select. Changing the contents of any drop down list or selecting/deselecting a check box will broaden or narrow the number of properties displayed by your search. You don't have to wait until the search completes to select/deselect items for your perfect search. You must hit the SEARCH button to start your first search. It is unnecessary to hit the SEARCH button after doing your first search, unless you changed to another web page, changed the Arrival Date or number of Nights. Add to Favorites: As you visit individual property pages or pages with listings of several properties on them, you have the option to click on the "+ Favorites" for each particular property, which automatically adds the property to your list of Favorites for consideration. The number next to the Favorites tab, left sidebar, will increase up to 99 possible Favorites. When ready, click on the Favorites tab to view a list of your selected Favorites. Remove from Favorites: You may de-select (remove) properties from your Favorites you no longer wish to consider by either clicking on the minus icon to the right or by clicking on the "- Favorites" displayed on property list pages and each property details page for properties listed in your Favorites. Compare Favorites: Click in the check boxes to the left of the property name, in your Favorites, you wish to compare. No more than 3 boxes may be selected at one time. When ready, hit the Compare button for a comparison of the 3 selected properties. Follow the above "Remove from Favorites" instructions to remove a property from the comparison and your Favorites. To add another property from your Favorites list for comparison, click the check box to the left of the property name in your Favorites and hit the Compare button. Repeat the above steps to find your ultimate vacation accommodations. Need assistance or have questions, please give us a call so we may better serve you! View List: Displays a full list of all your Favorites with some details. Remove All: Clears all properties from your Favorites so you may start over.